The stolen jewels were worn by King Charles IX and his wife Queen Christina. Just before lunchtime on Tuesday, thieves entered a cathedral in Sweden, stole two royal crowns and an orb before jumping into a small speedboat and making their escape. 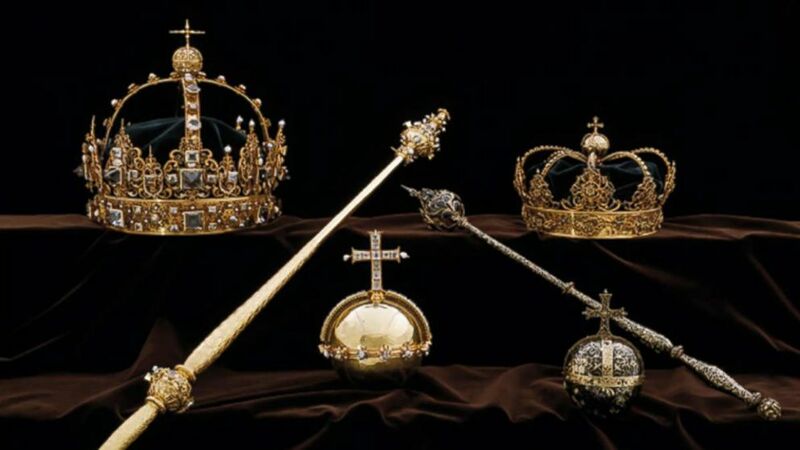 Swedish police said the stolen crown jewels are from the 1600s and were part of the funeral regalia of King Charles IX and his wife Queen Christina. The jewels were stored in the cathedral in the town of Strängnäs. After the theft, multiple people were seen leaving the cathedral in a boat that was waiting right outside, police said. (Swedish Police) On July 31, 2018, robbers stole two crowns worn by King Charles IX and his wife Queen Christina from a Swedish cathedral. Several police officers are taking part in the search for the perpetrators. Police have used helicopters to try to track them down. But on Wednesday morning, police said they still hadn’t made any arrests or found any suspects.